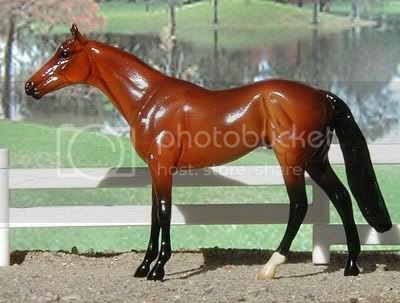 Model information: Breyer "Cigar" mold; #1192 Affirmed; produced 2003-2004. Sire's race record (Model Racing Form): (16)2-4-4-2 $226,086. 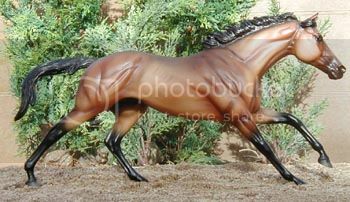 Model information: Breyer "Cigar" mold; Seabiscuit; special run sold through QVC in 2001. Sire's race record (Model Racing Form): (19)6-6-1-1 $936,012. Dam: 1 start at 2, placed. Awards: Raced with the Model Racing Form by Coldspring Farm; (10)2-3-0-3 $85,450. 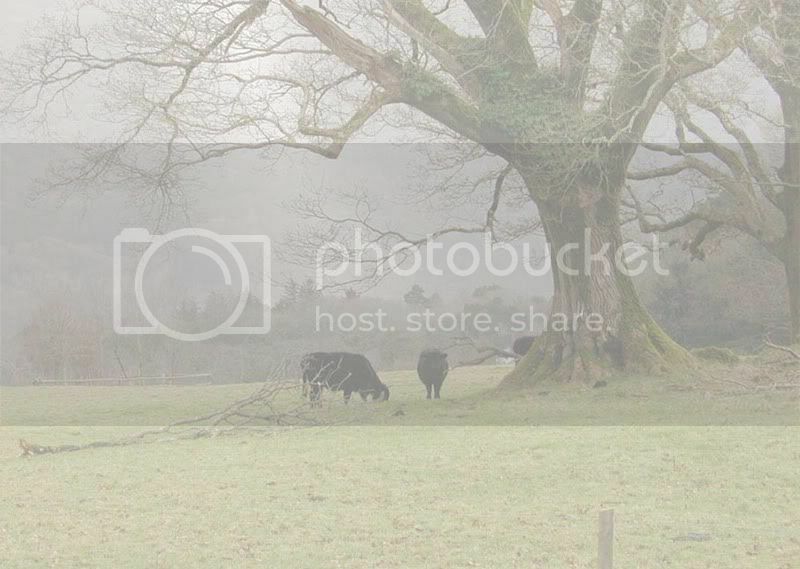 Photo show placed in halter with Red Wolf Ranch. 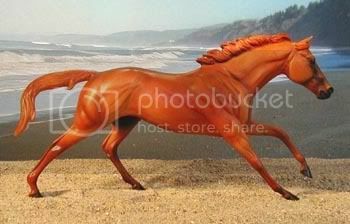 Model information: Breyer "Phar Lap" mold; #710295 Race Horses of America set; special run for the 1995 JCPenney holiday catalog. Lines to Rock Point, Private Account. Model information: Breyer Classic scale "Man O War" mold; #750333 Seabiscuit and War Admiral" Set, special run sold through Wal-Mart stores in 2003. 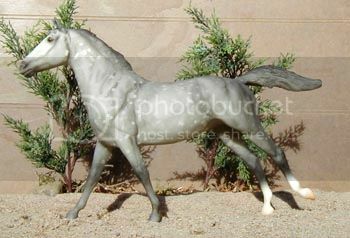 Model information: Stone Chips scale Thoroughbred mold; regular run. 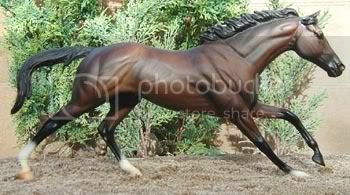 Model-bred close up, but all lines trace to real horses. 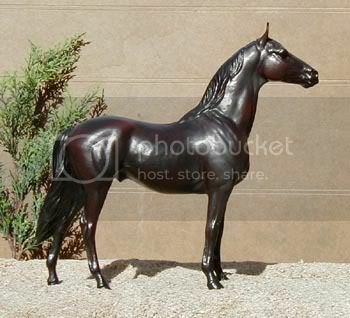 Model information: OF Breyer Phar Lap mold; "Eros" 1999 USET Festival of Champions, special run, 1500 made. Lines to Northern Dancer, Seattle Slew, Cyptoclearance, Buckpasser. 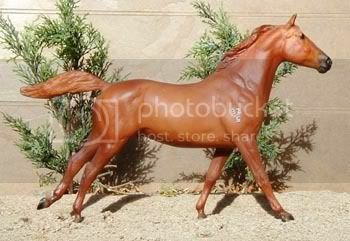 Model information: Breyer "Cigar" mold; #476 "Cigar," Famous Race Horse, produced 1998-2005. Lines to Afleet, Lyphard, Tizna, Riva Ridge. 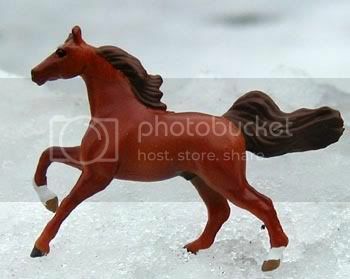 Model information: Breyer Mini Whinney mold; Mini Whinney Stallions set, produced 2005-current.